Art & Faith Matters: Mark 10.35-45: Prepared for Whom? Mark 10.35-45: Prepared for Whom? It is for those for whom it has been prepared. That's what Jesus tells James and John when they ask to sit beside him in glory. To sit at my right hand or at my left is not mine to grant, but it is for those for whom it has been prepared. But it begs the question: For whom has it been prepared? In art, Jesus in glory seems to be most-often surrounded by a host of angels or by symbols of the four gospels (and remember their relationship to Ezekiel's creatures and the creatures in Revelation). 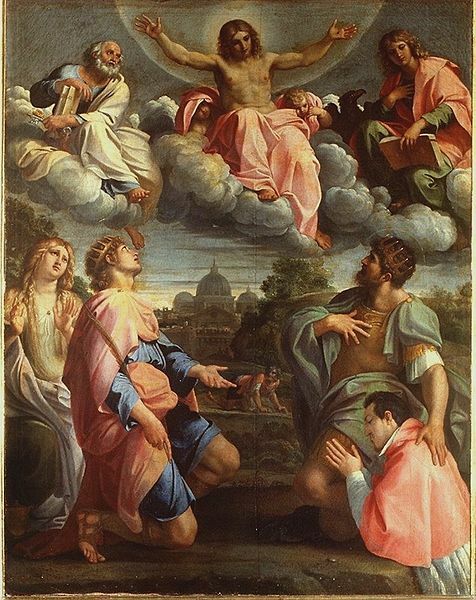 Annibale Caracci's "Christ in Glory" (below left) has Peter on Jesus' right and John on Jesus' left. At least one of the brothers made it in that version. A search for "Jesus in Glory" or "Christ in Glory" often shows the Transfiguration - where Elijah and Moses flank Jesus. No disciple emerges as a favorite in those depictions. Another thought process says that if Jesus is seated at the right hand of God, then God would be sitting on Jesus' left. The best candidate for whom would be on Jesus' right is his mother Mary, often depicted as the queen of Heaven. The rightful place for a queen is at the king's right hand. 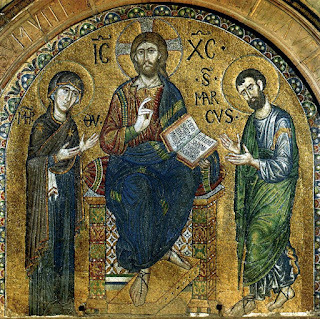 In the thirteenth-century mosaic shown here, Jesus is enthroned, with Mary standing at Jesus' right hand and St. Mark is at his left hand. The mosaic is located on the main portal of St. Mark's Basilica in Venice. Again, James and John miss out. (Left) Annibale Carracci. Christ in Glory. 1597-1598. Florence, Italy: Palazzo Pitti. (Right) Main portal mosaic. c. 1250. Basilica di San Marco, Venice, Italy. 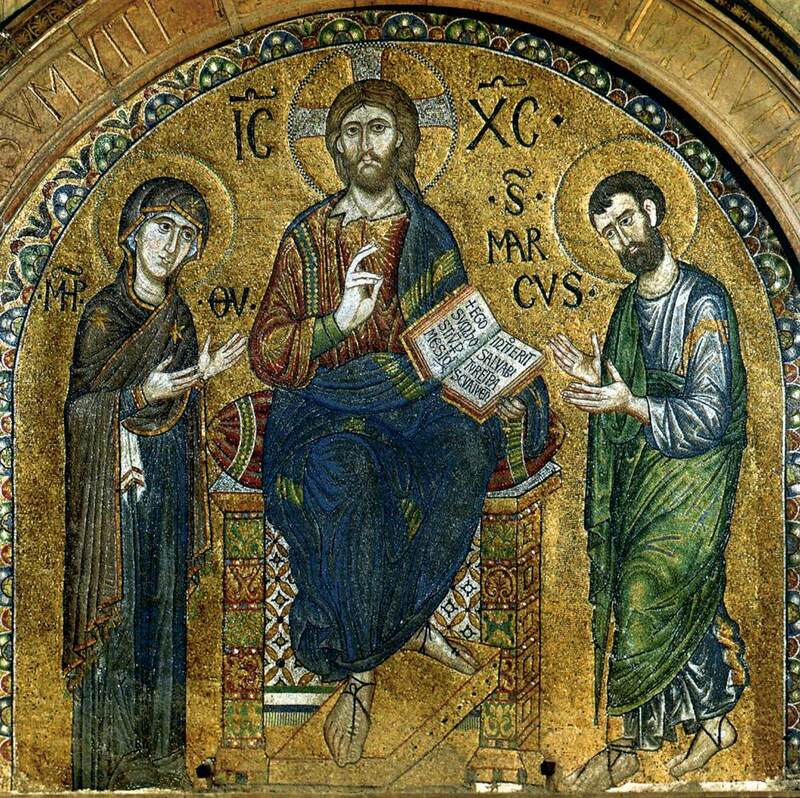 There is, of course, a time in scripture where two people are given places on either side of Jesus. And though James and John promised that they could drink the cup and be baptized with the baptism, they probably didn't have this in mind. Jesus is crucified between two thieves. At least on the day of crucifixion they were the ones on Jesus' left and right. Is that something like the last being first? For thoughts on Job 38, click here. For additional thoughts on the disciples' request for greatness, see this week's Facebook post.